Do you like my fancy graphics? Never had a single graphic design lesson–can you believe it? In case you’re in the second category, kombucha is a fermented tea beverage that’s often sweetened with fruit juice. It’s available in many health food stores and, increasingly, even mainstream grocery stores across the country. (I bought the bottle pictured above at Trader Joe’s.) 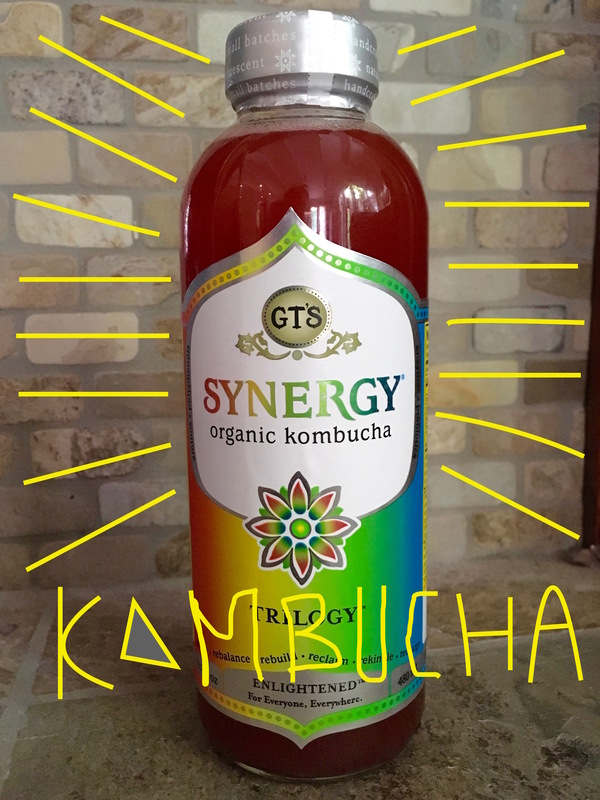 I’m not sure when I first heard of kombucha, but like my experience with overnight oats, I was a little late to the game…and when I found out it was made using what’s known as a “SCOBY”–“symbiotic culture of bacteria and yeast”–it sounded, frankly, pretty disgusting. But when a fellow nutrition intern told me she loves the taste and drinks it everyday, I decided to do some research and actually give it a try. See, kombucha has been touted as a functional food, meaning it is purported to have certain health benefits. Somewhere along the way, this fizzy drink has developed what marketers call a “health halo”–the perception that something is healthy (whether or not it actually is) based on associations we make with it, like “I see my yoga teacher drinking kombucha. It must be healthy!” I’ve seen it touted as a “detox” beverage that will heal your liver, boost your immune system, and prevent cancer. As a nutrition professional, I wanted to look into the facts behind these claims. What can I say? I like my foods evidence-based. So here are eight bits of information a nutritionist wants you to know about kombucha. I hope you’ll find them helpful, whether you’re the hipster already selling your own kombucha at the farmers’ market or the person at the grocery store wondering if that drink with the vaguely Japanese name is the same as Vitamin Water. 1. Kombucha is made with bacteria and yeast. As mentioned above. Like sourdough or Amish friendship bread, kombucha begins with a bacteria and yeast “starter.” Therefore, people who have certain health conditions that compromise their immune system would do well to avoid it. 2. There have been no human studies conducted on kombucha’s health benefits. Which is enough for me to say it has no proven health benefits. 3. Home-brewing kombucha requires extreme caution. Since making kombucha yourself involves fiddling with bacteria and yeast and keeping conditions perfect so your microorganisms don’t grow out of control or become toxic, it is a risky endeavor. If anyone ever offers me their home-brewed kombucha, I’m going to politely decline. 4. It’s an acquired taste. An optimistic description I read about the taste of kombucha went something like this: “the flavor of sour apples and stone fruit mixed with tea.” While the taste depends on how a particular kombucha has been flavored, be aware that your palate is in for a very unusual experience. I would describe it as an acidic blend of sweet and sour. 5. Kombucha is a fermented food, and fermented foods have been shown to benefit the gut microbiome. 6. Ounce for ounce, it’s more expensive than other fermented foods with proven health benefits. Yogurt, kefir, sauerkraut, and other fermented foods with actual scientific evidence of health benefits aren’t likely to cost you $3-5 for 16 ounces like kombucha will. Or maybe that’s just me? (The gas part.) When drinking kombucha, keep in mind that it is a very carbonated beverage, which can have unpleasant GI side effects for some people. 8. Bottom line: If you are a healthy person who likes kombucha for its taste, I say it’s fine to drink it as your sweetened beverage of choice. Sugar-wise, it’s a far better pick than soda, and contains less sugar than fruit juice. It doesn’t appear to have any adverse health effects, but it certainly hasn’t been proven to have any health benefits, either. Quite enlightening! Thanks for doing the research.